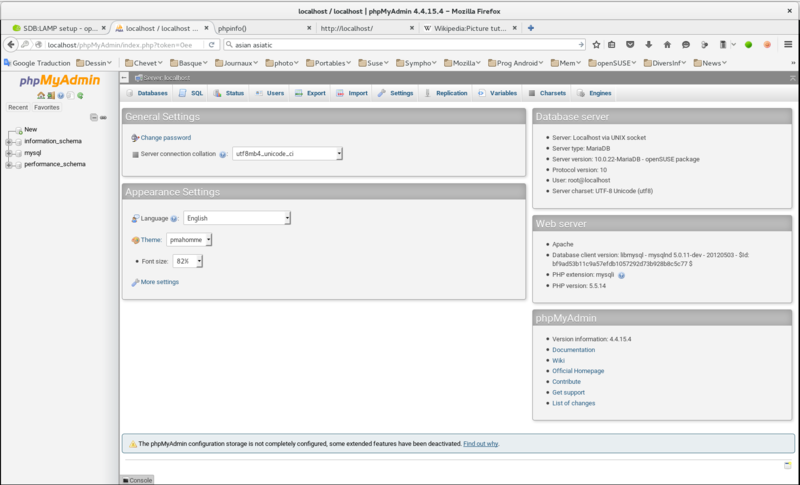 phpMyAdmin with a configured pmadb database. The needed time for the whole installation is around 20 minutes but it may depend on the performance of your Internet connection. This article is updated to reflect the installation in currently supported openSUSE Leap and Tumbleweed. However it does not deviate much from lower versions of openSUSE. After entering a valid password, the prompt should turn red and end with a #. Now point your favorite Web browser to: 'localhost'. You should see a page with Welcome to my web site! as a headline. In this state the web server is only accessible as localhost. If you want to give access to it from a remote host, you have to open port http (=80) in the firewall. Alternatively, you can do this using YaST and selecting Security and Users --> Firewall --> Allowed services and add HTTP server. As root execute this. Note that this assumes that the zone you have configured is public. Replace public with your zone you have selected. Once you add the firewall rule reload firewall service. Note the Zone that the network is running and ensure that the current zone is selected under the Zones tab. In the Services tab, locate apache2 in the window. If no further changes to the firewall are required, close the Configuration window, changes are immediate. Your are done, php7 is now installed. 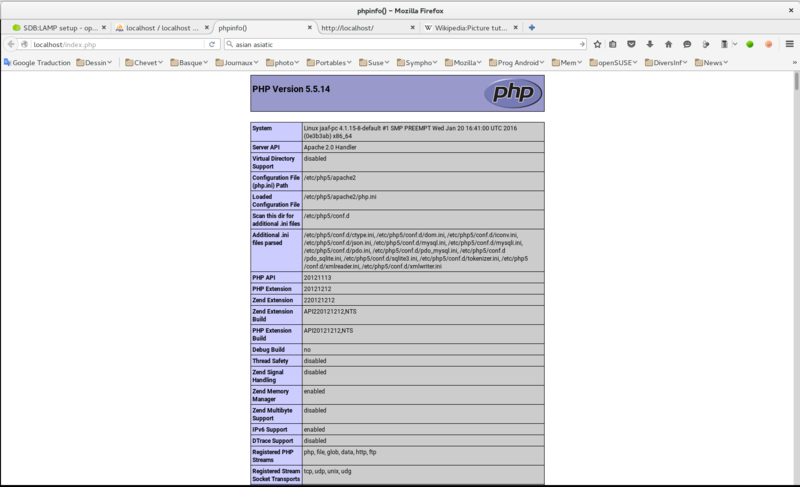 Note you need to choose if to install php7 or php5. You cannot have both of them. 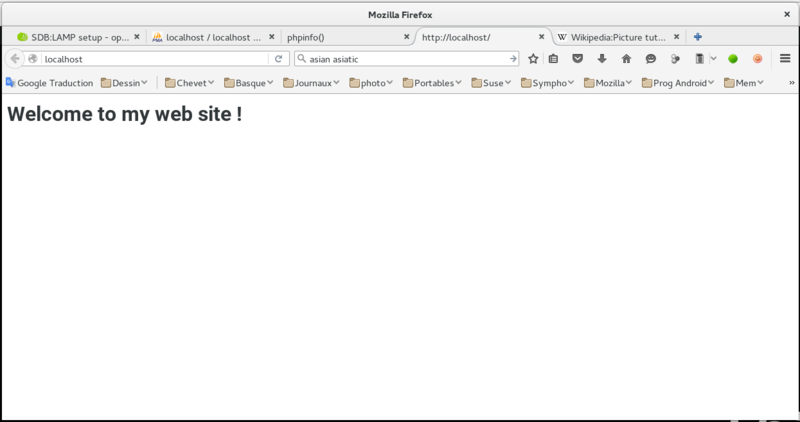 Now, point your browser to 'localhost/index.php'. You should see a page containing a table with all php settings displayed. MariaDB is an alternative package for MySQL, so further on the name mysql is used. If you want to read the messages issued by the server cat the /var/log/messages. To configure the MariaDB server with improved security, please use the script 'mysql_secure_installation provided by openSUSE. Hereafter is the description of the full process. Enter the password for root now. Reloading privilege tables.. ... Success! By default, a MariaDB installation has an anonymous user, allowing anyone to log into MariaDB without having to have a user account created for them. This is intended only for testing, and to make the installation go a bit smoother. You should remove them before moving into a production environment. Answer y to remove anonymous users. By default, MariaDB comes with a database named 'test' that anyone can access. This is also intended only for testing, and should be removed before moving into a production environment. ... Success! - Removing privileges on test database... ... Success! Reloading the privilege tables will ensure that all changes made so far will take effect immediately. Cleaning up... All done! If you've completed all of the above steps, your MariaDB installation should now be secure. Enter the present password or press only Enter if it has never been defined. phpMyAdmin — a.k.a. pma — is a tool to administrate your databases from a Web interface. This also installs a number of needed php5 modules and restarts the apache2 server. Normally you should get an error message complaining about the lack of the Multibytes String extension. That is the object of the next section. Now point your browser at http://localhost/phpMyAdmin/ or http://ip_address/phpMyAdmin/ and enter the mysql root username and its passord. That's all! You can now administer your databases from a Web interface. You can read the documentation on phpMyAdmin on the phpMyAdmin website. You should have a working LAMP server now! This page was last modified on 4 April 2019, at 21:09. This page has been accessed 268,513 times.